It is generally accepted that chocolate was once the prerogative of the elite. Given that, it makes sense to me that ice cream, which can be a sublime dessert, was also once a luxury reserved for those who could afford costly foods. While historians argue over whether the ancestors of modern ice cream were first seen among the Romans or the Chinese, it should be remembered that these early desserts were fruit- or alcohol-based ices. When Catherine de’Medici was married to the future Henry II in 1533, it is said that an early version of ice cream was the highlight of the wedding feasts. Unfortunately, there doesn’t appear to be any genuine historical evidence for that. While the true origin of ice cream may be lost to history, this frozen dessert was being eaten in the US before 1777, when it was advertised in the New York Gazette; the fact that ice cream was being advertised suggests that a good portion of the population was already familiar with it. Ice cream socials became a common way to entertain friends and family, especially after Nancy Johnson invented the hand-crank freezer in 1845. Frozen desserts gradually became a treat for the masses, no longer reserved solely for the wealthy or elite. Ice cream’s appeal continued to increase, and with more demand came an unfortunate consequence: industrialization. Except for the few Americans lucky enough to live near small-scale manufacturers who actually cared about their product, ice cream became a fluffy, sticky, too-sweet, artificially-flavored mess. Then, in the 1980’s, Ben & Jerry’s burst onto the scene. Two friends in Vermont who took up ice cream making because bagel manufacturing equipment cost too much, Ben and Jerry developed a cult-like following of devotees who banished all other ice creams from their spoons and their freezers, and small wonder. Ben & Jerry’s ice cream contained good, real ingredients, usually in imaginative flavor combinations, and there were a couple of genuine, albeit eccentric, people behind it all. The gathering of this frozen dessert to our country’s collective heart was one of the great love stories in American food history; black indeed was the day that Ben & Jerry’s sold out to Unilever in 2000. But all was not lost. A number of, er, pint-size creameries have sprung up to try to bring innovation, good taste, and the human factor back into ice cream. A bit of research will show you any number of delightfully obsessive and obsessed makers of frozen desserts, especially those who make ice creams containing chocolate. Better still, many of them will ship directly to your door. I know people who don’t think twice about ordering steaks or flowers or chocolates online, so ordering ice cream via the web is no different. You just need to be certain that someone will be at the address where the package arrives, to pop those precious products precipitately into a freezer. Some of these frozen dessert artists call their products “gelato” or “sorbet”, while others use the term “ice cream”. There are important differences. Sorbet (the French term; the Italians call it “sorbetto”) contains no dairy products. Although sorbet is most often seen in fruit flavors, you can find others, including chocolate, and there are some excellent chocolate sorbets available. Ice cream and gelato both contain dairy products; the differences are in type of dairy products used and a mysterious something referred to as “overrun”, which we’ll discuss a bit further on. True ice cream usually contains more cream than milk; traditionally, gelato is made from milk, with just a little (if any) cream added. The resulting butterfat (also called milkfat) percentage of gelato is lower than that for the ice cream “heavyweights” (that’s the superpremium category). Typically, gelato will run from 4% to 14% butterfat, while superpremium ice cream is 15% to 18% butterfat. Proponents of gelato believe that ice cream’s higher butterfat content coats the mouth and the tongue (where the taste buds are located), thus obscuring the product’s true flavor. Aficionados of superpremium ice cream, on the other hand, believe that fat is one of the chief carriers of flavors, and that the gelato people make a nice product, but one not in the same league as their ice creams. By the way, if you run across anyone touting gelato as a frozen dessert with fewer calories and less fat, well, technically, it’s true. Gelato usually has less fat and fewer calories than superpremium ice cream. Unfortunately, gelato cannot qualify as a low calorie dessert by any stretch of the imagination (you may pout now). In addition, rather than using flavorings of any kind, gelato uses the real ingredients (strawberries, not strawberry flavoring, etc). Note that these definitions are for traditional gelato only; while there are federal standards for ice cream regarding permitted ingredients and required percentages of ingredients, these don’t exist for gelato, so anyone can make any kind of frozen dessert and label it “gelato”. And about that “overrun”…it’s the industry term for the amount of air in your frozen dessert. If you didn’t know, ice cream and related frozen desserts are most often produced in a continuous-batch freezing system these days. As opposed to the old hand-cranked churn, the continuous-batch freezer allows manufacturers to make their product much more quickly and efficiently, without ice or salt, and with much less hand labor. But the manufacturers can also determine the amount of air they want churned into their frozen dessert base. Air increases the volume of the dessert, so manufacturers can turn out more product with less cost. A small amount of air in an ice cream or a gelato isn’t a bad thing, but you’re not always getting just a small amount. Pete Palazzolo, of Palazzolo’s Artisan Gelato & Sorbetto, states that most inexpensive brands of ice cream in the US consist of 30% to 60% air (that means they have 60% to 120% overrun). Gelato averages around 10% air (20% overrun). Less air makes for a very creamy, as opposed to a sticky and fluffy, texture. Incidentally, ice cream’s remarkable popularity has never faded. According to www.MakeIceCream.com, a whopping 98% of all American households purchase ice cream, and Americans are the second-greatest consumers of frozen desserts worldwide (we average 23.2 quarts per capita, a total that includes ice cream as well as other frozen treats; only the citizens of New Zealand eat more). For most people, too much of this consumption is of industrial, high-air-content ice cream. It’s OK if you’re desperate or don’t know any better, but supposing you’ve decided to raise your standards? What should you look for in a good-quality frozen dessert? Fewer ingredients are generally better. If you’re looking at a sorbet, the first ingredient should be fruit; for an ice cream or gelato, cream or milk should be first on the ingredient list. Except for a sorbet, you may see a stabilizer, such as an egg. Look, too, for real foods, not flavorings or extracts, to provide your flavor. That is, a strawberry frozen dessert should contain real strawberries; a chocolate sorbet/ice cream/gelato ought to have cocoa, chocolate, or both; and real hazelnuts should figure prominently in a hazelnut gelato or ice cream. The use of corn-based sweeteners, such as corn syrup or high fructose corn syrup, is not optimal. And finally, a high-quality frozen dessert should contain no stabilizers other than egg. Others would include carrageenan, locust bean gum, guar gum, xanthan gum, and sodium alginate. These substances protect inexpensive ice creams against developing an icy texture or flavor loss during the lengthy storage periods for which they’re expected to remain in supermarket freezers. If you’re wondering what anyone could do to chocolate ice cream or gelato that wasn’t done by Ben & Jerry’s in their heyday, you just haven’t looked around lately. Want to see a mind-blowing roster of chocolate flavors? 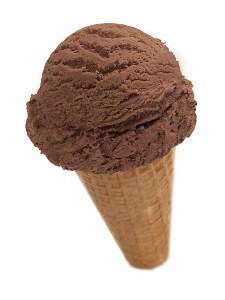 Head over to Palazzolo’s Artisan Gelato & Sorbetto, at www.4gelato.com, and click on “Gelato”. Chocolate has a category all its own here, and it needs one, with flavors such as French Chocolate Caramel Brandy Fudge and Chocolate Candied Ginger. Or check out Capogiro Gelato Artisans, at www.capogirogelato.com. There’s a more limited selection here, but Stephanie Reitano does some beautiful things with first-class ingredients. Try her Bacio (chocolate and hazelnut gelato with pieces of caramelized hazelnut) or the Cioccolato Mexicano (with ancho chiles, chipotle, cinnamon, and bitter almond). Jeni’s Ice Creams (www.jenisicecreams.com), always has some wildly inventive flavors, a few of which will contain chocolate (how about a Dark Chocolate Zinfandel?). Dr. Bob’s Handcrafted Ice Creams offers Dark Chocolate and Really Dark Chocolate flavors, in addition to Chocolate Chocolate Chip, Black Raspberry Chip, and a few more; see their site at www.drbobsicecream.com. Your local natural foods store may have products from smaller manufacturers, as well, and don’t overlook local artisans! For instance, The Bent Spoon (www.thebentspoon.net), in Princeton, NJ, makes wonderful ice creams and sorbets. They do ship, but their minimalist website doesn’t list current flavors (which are constantly changing). It’s worth a trip to Princeton and any lines out the door to try their products. For Thanksgiving of 2007, one of their flavors was Wild Turkey Bourbon Chocolate Pecan. Across the country, in Washington State, Mora Iced Creamery (www.moraicecream.com) lists a Swiss Chocolate flavor (chocolate ice cream with chocolate liqueur, shaved chocolate, and swirled dulce de leche---sign me up!) and a Gianduja (chocolate-hazelnut) as just two of their temptations. And this is a mere sampling of the ice cream artisans out there. Have I explained my uncle’s “NBC” diet? My uncle adheres strictly to a policy of “no bad calories”. That doesn’t mean he doesn’t consume dietary indulgences, such as ice cream; it means only that, if he is going to eat anything, it must be worth the caloric cost. In brief, Life is too short to eat mediocre food, especially desserts! Try some first-class ice cream or gelato soon. There are plenty of smaller companies producing both, and I promise you that the difference in flavor and texture will be a genuine eye-opener. In keeping with this edition’s frozen dessert theme, I present to you Bart’s Homemade. Homemade what, you ask? Ice cream, sorbet, and yogurt. This little business is run by a couple who used to be family therapists, of all things---talk about a career change! Nonetheless, we are fortunate that they did change jobs, because they produce some spectacular ice cream (they also make sorbet and frozen yogurt, in addition to another brand of ice cream called Snow’s. However, only Bart’s Homemade Ice Cream and three flavors of sorbet are available for shipping in pint containers). I very much like the idea that this ice cream producer is dedicated to supporting the independence and continuing operation of small family farms in their area, and the Bart’s Homemade devotion to sustainability is one that cannot be sufficiently praised here. But you want to know what’s what with the ice cream. I say, promise me anything, but give me the Chunky Chocolate Mousse with Raspberry! Chocolate ice cream, chocolate mousse powder, semisweet chocolate chunks, and a red raspberry ripple. Not your scene? How about some Deep Purple Cow? It’s black raspberry ice cream with white and dark chocolate chunks. Still not happy? No problem: have some Massachusetts Super Fudge Chunk---chocolate mousse, white chocolate chunks, brownie chunks, pecans, chocolate-covered almonds, and fudge ripple. Of course, if you’re a purist, a plain Chocolate is offered, too. I love the combinations I see here, and many ice creams that are not chocolate-based include chocolate “add-ins”. No worries if you can’t make it to one of their Massachusetts cafes, as Bart’s Homemade will deliver to your very doorstep via the convenience of online ordering. For a special occasion, or, better still, no occasion at all, surf over to www.bartshomemade.com. Who said you can’t buy happiness?